Secure your modern application by embedding Okta as the identity layer. Okta’s simple to use APIs and out-of-the-box tools enable developers to create seamless experiences for B2B and B2C use cases, while giving IT and Security teams a central place to manage security policies. Okta’s API Products serve as identity building blocks for your mobile or web applications, accelerating the time-to-market of your digital transformation. Provide your users a frictionless, secure experience. 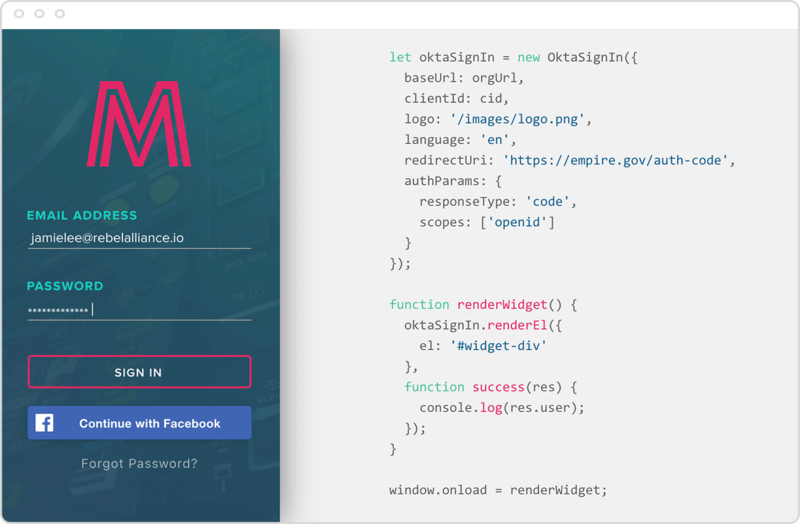 Leverage Okta’s prebuilt UI widgets for common user flows such as login, registration, and password reset or build a completely customized experience. Control which APIs your users and developers have access to using OAuth-as-a-service. Customize claims and scopes and insert external attributes using Okta’s token extensibility. Manage your users and security policies programmatically via APIs or from Okta’s user-friendly admin console. Create single-sign-on (SSO) experiences and manage the user lifecycle with automated on boarding and off boarding. Ranging from “no-code” to “pro-code”, get started with minimal development resources using Okta’s hosted customization tools, or use Okta’s SDK and REST API to build with the programming language and framework of your choice. Scale with confidence with guaranteed 99.9% uptime SLA*. 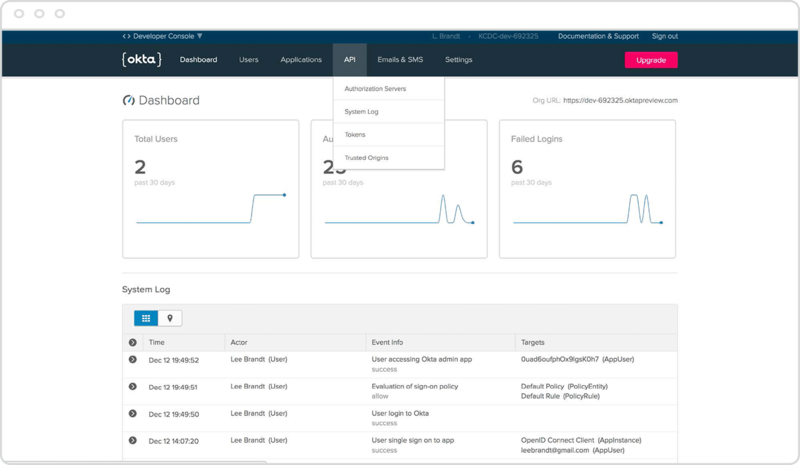 Monitor potential security threats in real-time with the admin System Log. HIPAA, FedRAMP, GDPR, and PSD2 compliant. Easily drop authentication into your app. Use our pre-built sign-in widget or customize the experience to match your brand. Save your users from having to create a new accounts. Sign in with popular social providers such as Google, Facebook, and LinkedIn, or any 3rd-party OIDC provider. Easily create directory integrations to your existing enterprise IDP, such as Microsoft Active Directory or LDAP. 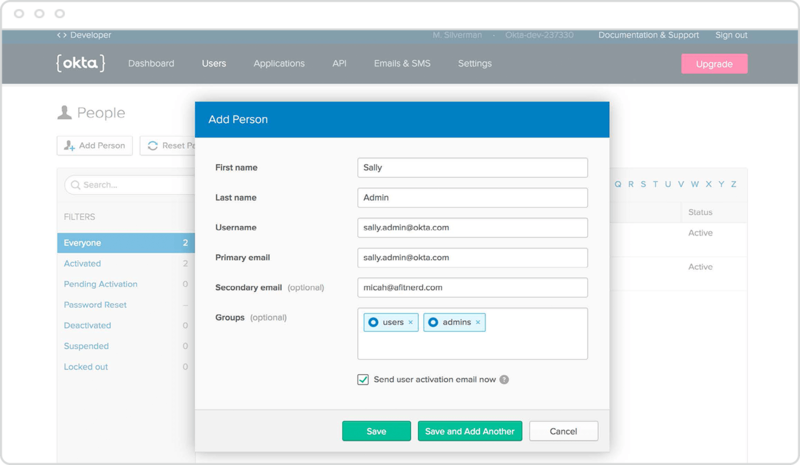 Inbound federation support for SAML and WS-Fed connections so your users can sign in with their existing identity provider. Save time from having to build common use cases including registration and password lockout and recovery. Customize email templates and SMS responses in over 20 languages. Set trigger points and leverage webhooks to customize additional steps to create your desired workflows. Add an additional layer of security to your user login without compromising user experience. Based on login context, intelligently challenge for additional factors including SMS, biometrics, push verification, single use passcodes, or Yubikey. Allow downstream 3rd-party applications to prompt users for permissions to access a set of their attributes (scopes) defined in Okta’s Authorization Servers. Consents will remain valid until users choose to revoke these privileges. 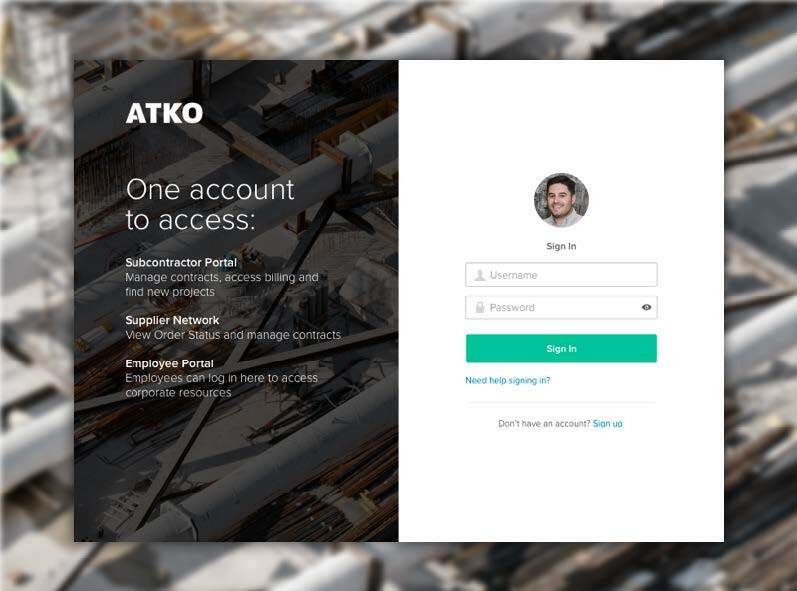 Use Okta’s OAuth 2.0-as-a-service offering to secure access to the APIs you are exposing, whether to internal developers and systems or external partners and developers. Allow your IT/security team to enforce and modify policies without having to write any custom code. Maintain all your users, groups and devices, and policies in one place, hosted in the Okta Identity Cloud. Do everything programmatically using code OR use the user friendly admin console to add, delete, or update user and groups. Easily add the ability to allow your users to self register accounts by embedding a “Sign Up” button that links to a customizable registration form. 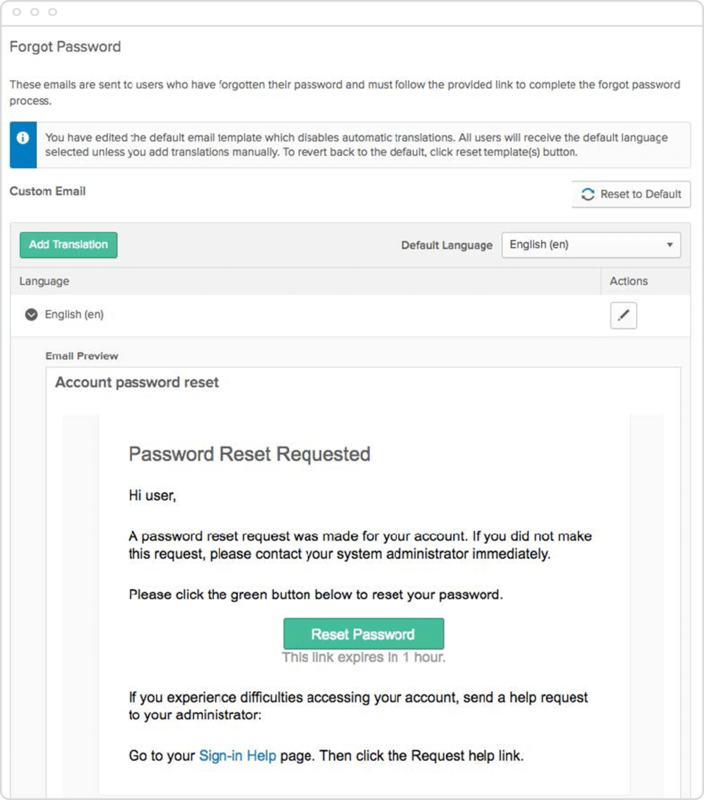 Manage fields and post registration processes such as requiring an activation email from Okta’s administration console. Create seamless single-sign-on (SSO) experiences and manage user lifecycles with automated on boarding and off boarding. Easily connect your users with popular 3rd-party cloud and on-premise systems application using Okta’s extensive network of 5,500+ integrations. Looking for no-code or low-code options? Design your uniquely branded sign in experience and error pages by choosing your logo, background image, themes and colors from Okta’s administration console. Okta automatically translates your customization requirements into code and instantly applies changes with a click of a button. Get started in minutes. SDKs for modern development environments and full protocol support. Real-time visibility and anomalous behavior reports. Leverage the same Okta Identity Cloud backend that millions of end users rely on to access their applications and secure their identity. Guaranteed 99.9% SLA*. JetBlue rolls out next-gen travel. Okta keeps the data safe and secure.